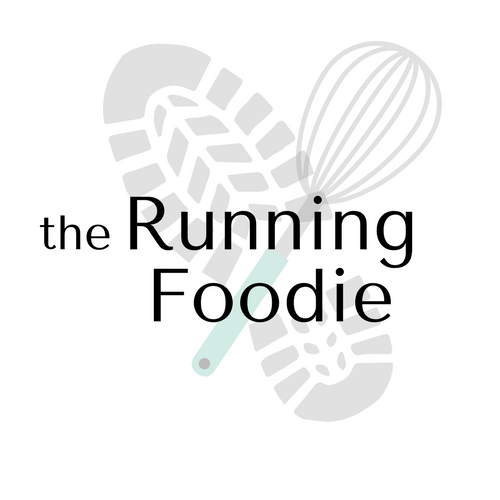 You may have heard of xylitol before, but if not I'll sum up. Xylitol is a natural sugarless sweetener made from corn cobs or hardwood trees like birch. Emerald Forest Xylitol only uses Northern American hardwood, which differs from the majority of xylitol available on the market that uses corn cobs. I don't know exactly what the difference between xylitol produced from hardwood and corn cobs is, but if you prefer to buy from an American company, Emerald Forest is for you. Xylitol is the same sweetness as sugar, has 40% fewer calories, and 75% fewer carbs. In about 95% of recipes it is a literal sugar replacement. Xylitol is well known in 2 specific areas - the dental and diabetic communities. In the dental community it is well known because it is proven to prevent cavities. Xylitol creates an environment in your mouth where bacteria literally cannot grow. Sugar is a fuel for bacteria growth and Xylitol is an inhibitor. With 6+ grams a day of Xylitol you will be well on your way to preventing cavities. Xylitol chewing gum, mints, and candies are primarily what you hear about from the dental side because the Xylitol disperses in your mouth over time - and we manufacture a full line of these products. They say that xylitol acts and tastes exactly like sugar. Unlike many other natural and artificial sweeteners, xylitol has no aftertaste (though excessive use can result in a mild laxative effect). After tasting it I can say it's really not like sugar, and definitely not as sweet. It almost seems like a mint in that the taste is rather cooling as it dissolves. My test today was to see if it was a good sugar substitute in baking. I don't often bake low fat or with reduced anything because I can always eat less, but every now and again a healthy alternative is nice to have on hand. I started with a simple spritz cookie press recipe, replacing all the sugar with xylitol. 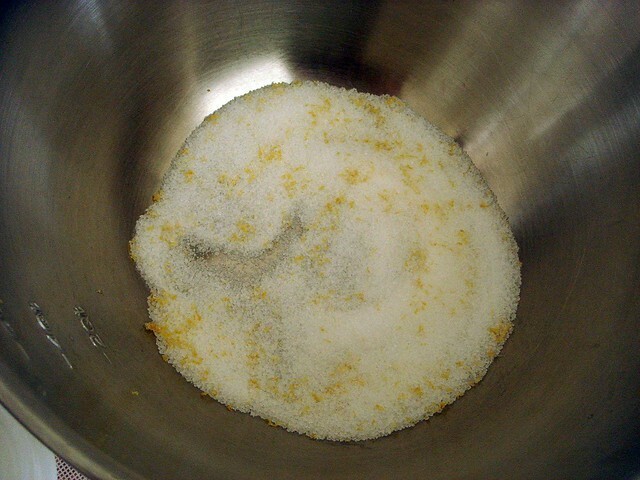 Lemon zest was pressed into the xylitol to release the oils and give the cookies a burst of lemon. Since the xylitol is more coarse than granulated sugar, I wondered if it was really going to affect the outcome of the cookies. 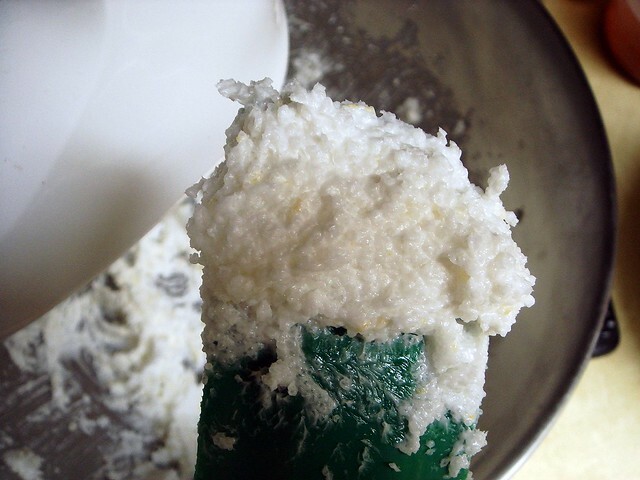 Usually after creaming the sugar with the fat (shortening, in this case), you can still feel granules of sugar if you press the mixture between two fingers. This is often why bakers use superfine sugar, though it really doesn't affect the consistency or texture much at all. However, in this case you could still feel large granules of xylitol, sort of like baking with coarse sugar (which is often used to finish a baked good as the sugar won't dissolve from the heat as easily as does granulated sugar). After adding the egg, vanilla extract, and flour, the mixture was more crumbly than I remembered it being, but still came together and went through the press without a problem. Upon close inspection I could still see shiny crystals of xylitol in the dough. When I ate a little I could taste the crunch of the crystals, and the dough wasn't really sweet nor flavorful. Strangely enough, the lemon flavor was nonexistent. When the first batch finished baking I could tell the texture was different. The cookies seemed spongy and bendable while warm, much different than how they usually are when made with sugar. When cooled, the cookies firmed up well enough that they could be shipped. The taste was lacking, though, as these cookies weren't very sweet at all. 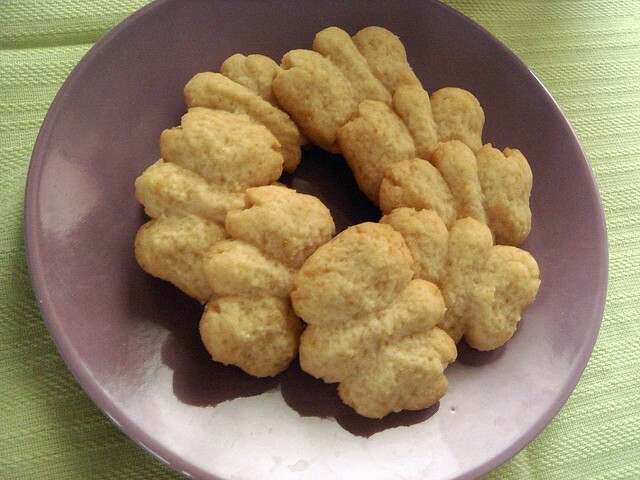 I would think of these cookies like shortbread -- buttery, sweet, with a flaky and sandy texture. Much of that was missing and although they did taste good, I could tell that I would eat more of them since my taste buds weren't satisfied. The cookies were also speckled. This was probably due to the xylitol leaving marks when it melted. I used xylitol earlier in a chocolate chip cookie recipe, replacing just the granulated sugar with xylitol (there was also brown sugar). The dough that was baked the same day had the speckled marks, but the dough baked the next day had smooth tops. The taste was also a little different, as was the texture. It wasn't that bad of a difference, but it definitely did not taste like cookies made with sugar. I'm sure if you were to decrease sugar consumption you might adjust to the taste of baked goods with xylitol. Overall, I can't say I'm pleased with my experience using xylitol in baking. I might just use it in the future to replace a portion of the regular sugar. From this take, xylitol won't make your baked goods taste exactly the same, but if you need to reduce your sugar intake I'd give it a try since the benefits outweigh the negative. I like the cookie shapes! This was interesting to know. Have you tried baking with Truvia? Rose - Me too! I really like the butterflies for spring. Chika - I haven't, but I have baked with Stevia In The Raw. The chemical properties aren't the same as sugar, so you can't use it as an entire substitute. The xylitol didn't ruin the makeup of the cookies, but it didn't taste as good as if I used all sugar or even a mix of sugar/xylitol or sugar/stevia. They are correct in that this xylitol didn't have an aftertaste. sounds interesting, i've never really baked w/ sugar subs! Xylitol does not substitute very well in dry recipes like cookies, due to its high melting point and cooling effect when dissolving in your mouth. It also will not caramelize like sucrose. In a wet recipe like a chocolate cake it works fine, and is not less sweet per volume than sucrose. Thanks for the tips! I like that it's a natural sugar substitute, so I'm glad that it does work in other types of recipes. It worked here, but not with the results I wanted. 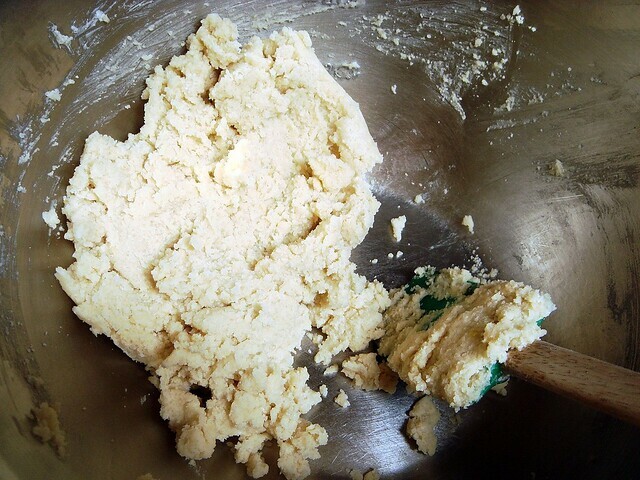 I wonder if I had ground it first if it would have blended into the dough better. 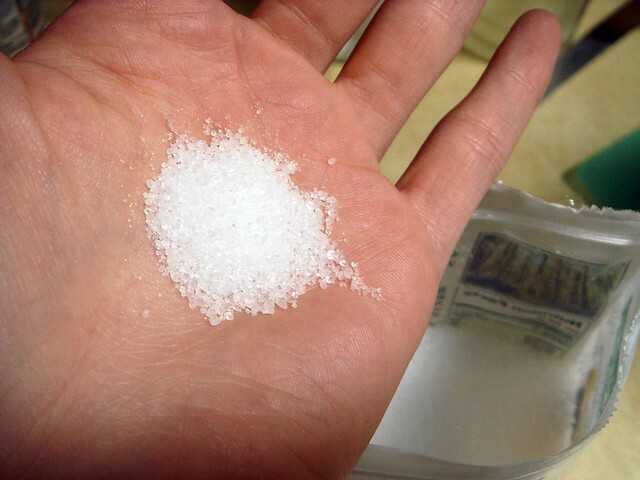 Thanks for your assessment of xylitol as a sugar substitute! I just bought some and plan to make my diabetic sweetie some baked goods he can enjoy over the holidays--it's good to have a realistic idea of what to expect. Hi Peg. 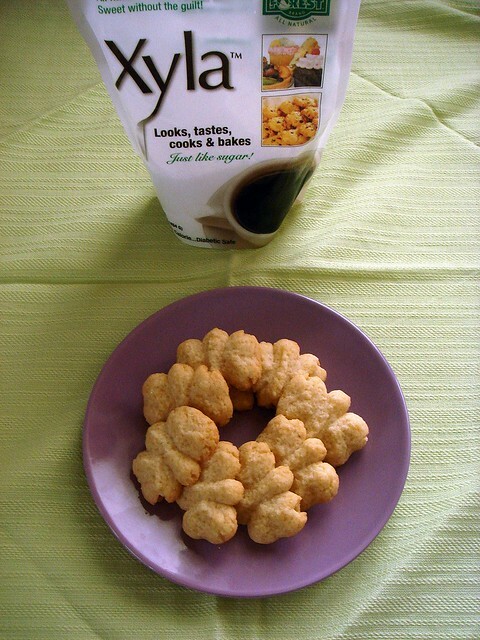 Xyla brands now sell an "extra fine" xylitol that blends better in baked goods. I think in order to replicate the sweetness of sugar, I'd have had to use more xylitol instead of a 1:1 substitute, though I haven't experimented enough to know for sure. What I did like is that it had no after taste. Xylitol is a very good alternative of sugar for diabetic people. It contains low-glycemic sweetener that offers sweet taste and does not have negative effects of sugar. It is a pure and naturally occurring white substance. I find I will use less, for me it is sweeter. But I agree it is heavier and I read you can use guar gum to combat. I haven't tried this yet though. It won't rise yeast and I have not been able to make candy apples with it. But it is all I use now for everything else. I make all my own sauces, jams and deserts as I am trying to avoid MSG.